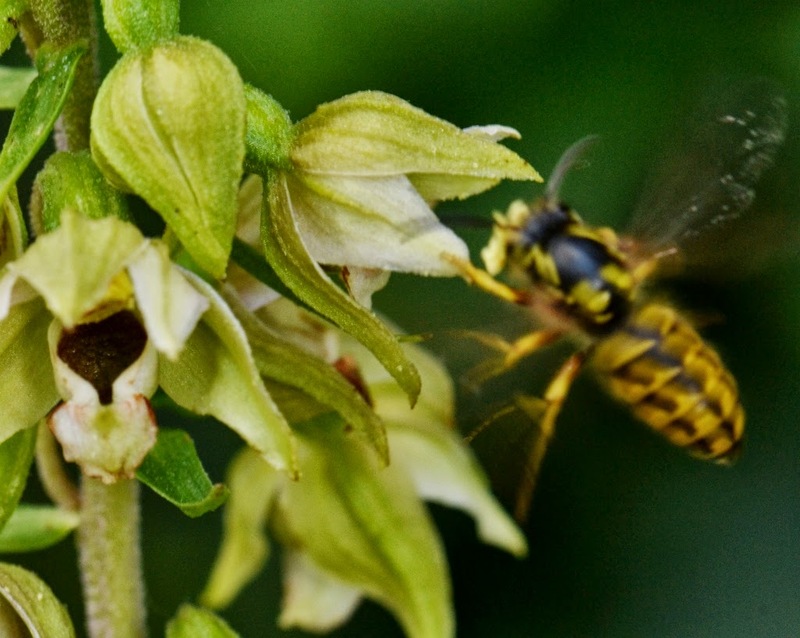 I mentioned in my last post that I had seen some drunken yellowjackets visiting orchids along a sidewalk in town. 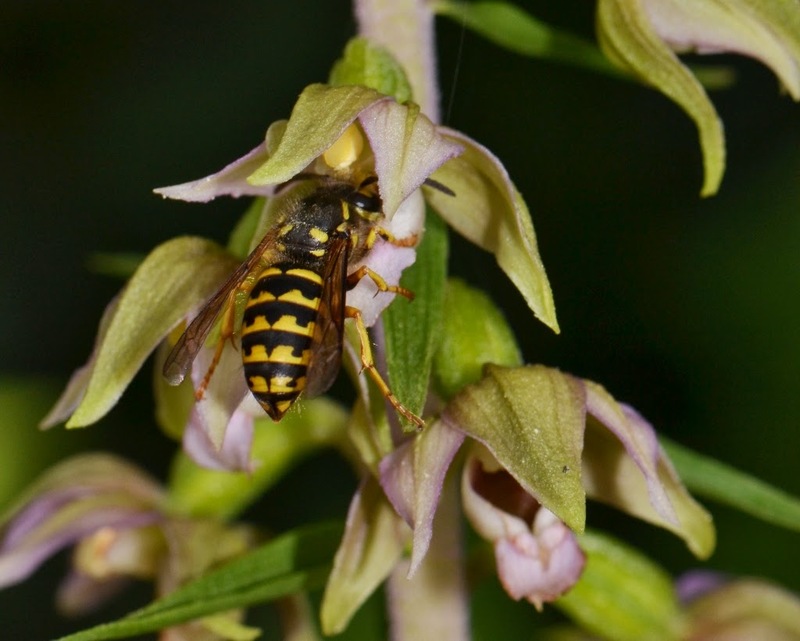 Here is a photo of one of those yellowjackets visiting the Broad-leaved Helleborine that grew among some ivy near someone's porch steps. 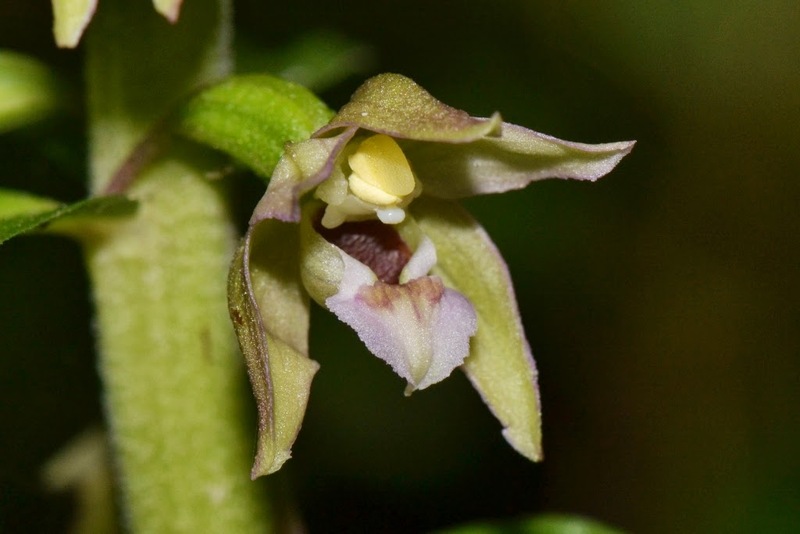 The Broad-leaved Helleborine is an orchid with an unusual pollination system. Unusual in that it attracts wasps and yellowjackets which are on the prowl for caterpillars. To do this, the plant (falsely) emits GLVs or green-leaf volatiles... GLV's are what the wasps home in on to find their prey. 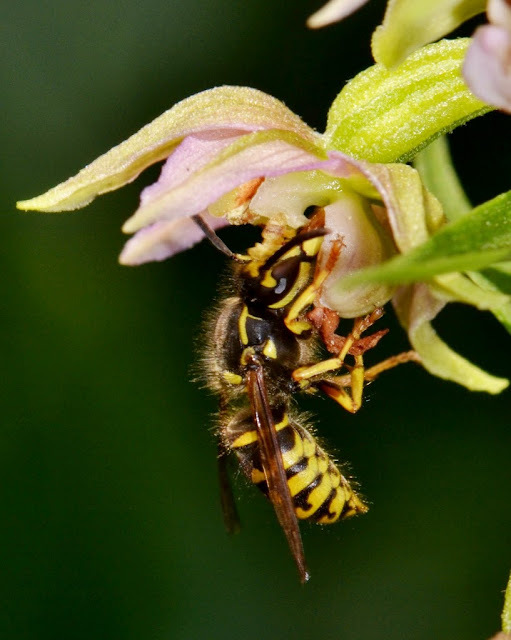 What the wasps find instead leaf-munching caterpillars are orchids flowers with spiked nectar. Here is a close-up of the orchid. 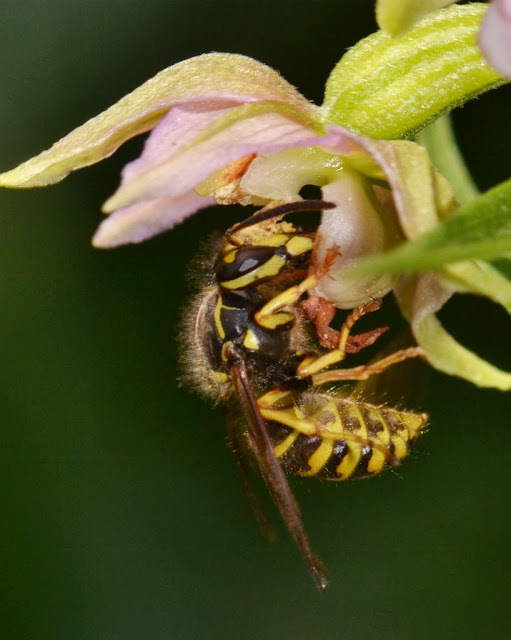 In the photo below, notice the orchid's pollia plastered on the yellowjacket's head. That is apparently the reason for the alchohol and narcotic-laced nectar. The impaired yellowjackets seem to go about their business without bothering to clean up, as you can see in the photos below. 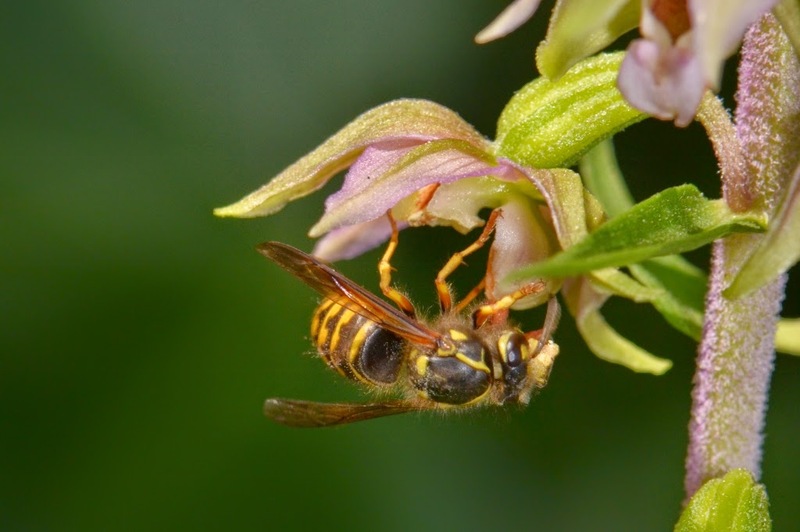 While the wasps are nectaring, they contact the sticky globs of pollen which adhere to their head. Since they are drunk, they apparently fail to notice the extra adornments on their heads... so they make their unsteady way to the next orchid to see what's on tap and in the process they cross-pollinate the orchids. Neat, eh? As I mentioned, I found these orchids growing as weeds in some landscaping along a sidewalk in town. 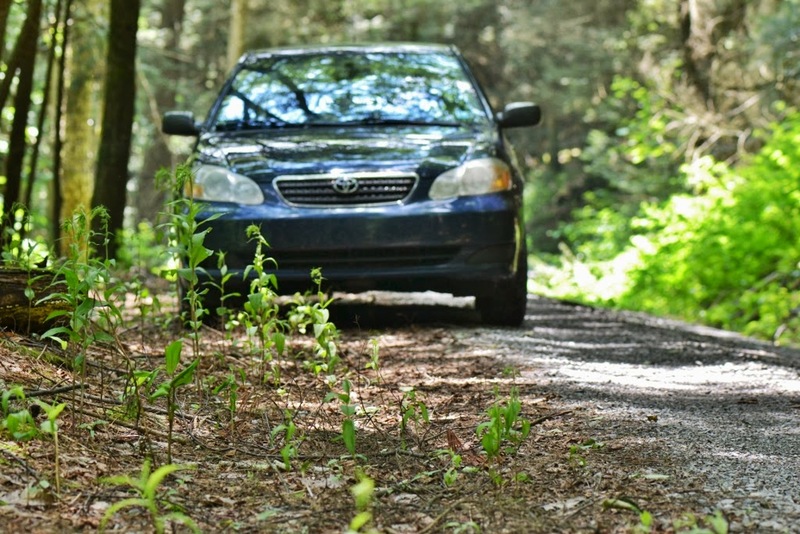 I also found patches of these orchids growing along woods roads through Hemlock forests. 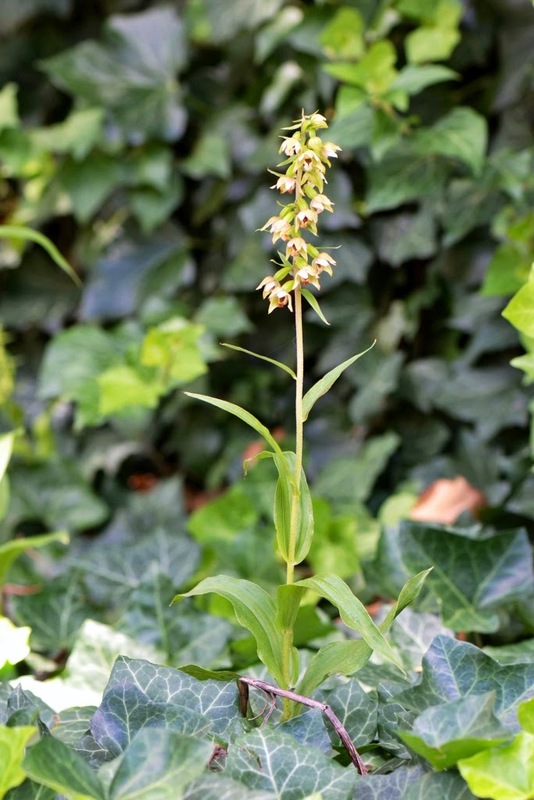 I have watched yellowjackets and wasps visit those roadside orchids. At the same time, I have also observed butterflies and bees that simply flew past the orchids... uninterested in the false aroma of caterpillar-chomped leaves. I hope you have had the privilege of observing this happen. Since I had a camera when the wasps were visiting the helleborine, I put together this post... even though I have previously written about these fascinating orchids. Welcome back Dana ! Hope you've had a great summer. One wonders why when there is a perfectly good pollination system (bees) already in existence, why this plant would evolve such a convoluted system ? It goes without saying, that I never knew about this till you pointed it out to me.